Project: Bathroom countertop with basin cut-outs. Wood: Wild walnut. Full stave, wide stave character slabs obtained from the same tree – bookmatched. Origin: British woodlands. The timber was kiln dried to below 10% moisture content using our on-site vacuum kiln. Features: Natural, oiled finish. Resin encapsulation, square edging, resin bark preservation, Earthy jointing system – live edge joint. The wooden surface is immersed in a blanket of translucent epoxy resin, preserving the earthy knots and enhancing the stunning natural patterns and striations. This is also an extremely effective method of protection as the top is waterproof and water-resistant. The wide stave planks are jointed in their raw edge using our innovative Earthy joint technique, complementing the organic ambiance. Glossy copper basins and Moroccan-style tiles (in situ) gracefully merge with the diverse yet subtle colour palette of wild walnut to accentuate the elegance of the countertop. Square edging provides a sense of uniformity to this otherwise extravagant wood-art centrepiece. Wood: Full stave English walnut (3 wide stave, character planks). Features: Earthy jointing system (epoxy river effect), resin inserts, live/waney edges, resin corner. 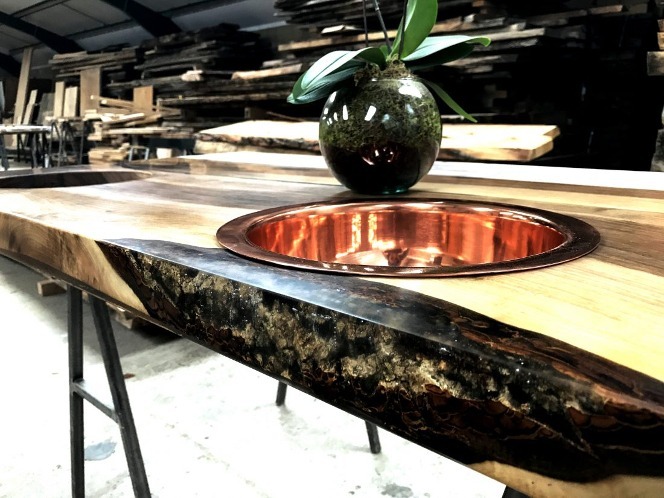 Beautiful state of the art table top engineered and handcrafted at our workshop in Plumpton Green, Sussex. Obtained from the same tree, stored at our timber yard and kiln dried to below 10% moisture content using our on-site vacuum kiln – the surface is extremely stable and resistant to damage. The table top is encapsulated in clear epoxy resin, which forms an impenetrable, translucent layer for maximum protection and aesthetic appeal. The fragrant blend of finishing oils intensifies the diverse colour palette of English walnut to enhance the stunning natural patterns and striations. 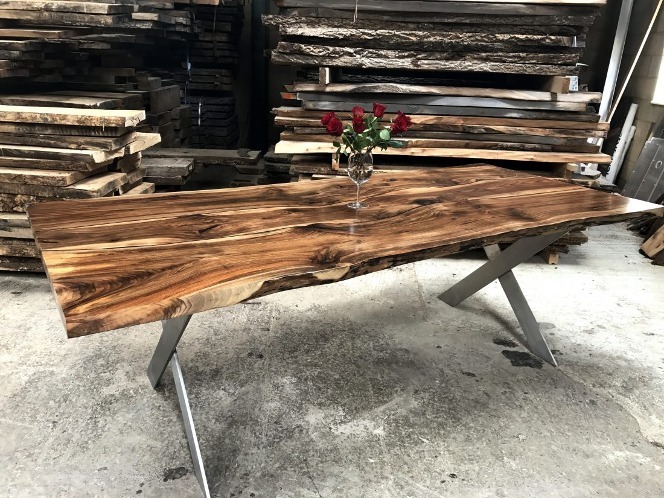 Earthy Timber combines classic design with raw allure and latest technology to craft one of a kind contemporary tables. Bespoke in every respect, unique in every detail. 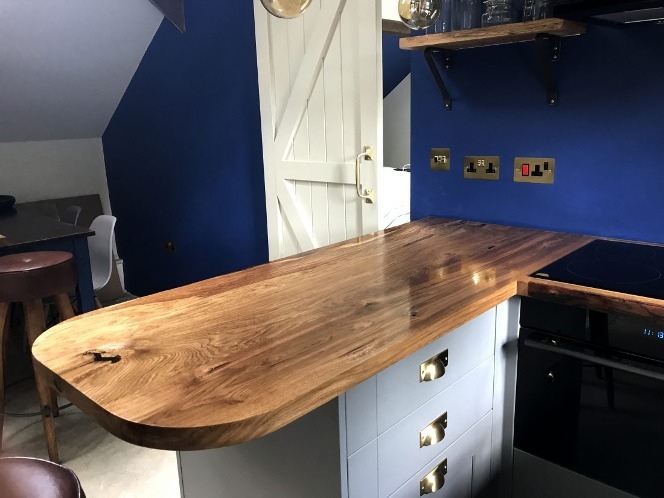 Designed and handcrafted at our workshop in Plumpton Green, Sussex, this bespoke set of resin-enhanced oak surfaces adds a touch of contemporary ambience to a charming cottage in Ansty. The service was extended to delivery and professional fitting by request, with cut-outs for the sink and hob being made on-site following numerous measurements to maintain accuracy and aesthetic appeal. Our creative customer was also supplied with off-cuts for personal use that would make stunning cheese and bread boards in sync with the theme of our tops. The hob cut-outs were enriched with our exclusive technique of bark preservation, which immerses the bark in a translucent blanket of resin. All timber used for this project was kiln-dried to below 10% moisture content using our on-site vacuum kiln, thus ensuring maximum stability. The full stave oak table-tops were treated with clear epoxy resin to enhance the earthy attributes, preserve their natural beauty and guarantee hygienic use. Accompanying the worktops are matching live-edge shelves featuring transparent resin inserts to match the design of the worktops. Shelves are an effective and efficient method of attaining extra storage room, and our customer cleverly chose to incorporate them into her bathroom and dining area where space was running a little tight. The luminous warmth of the solid oak tops combines beautifully with radiance of the brass handles to create a sense of harmony throughout the cottage. All surfaces were treated with a natural blend of fragrant oils to intensify the colour palette and provide protection. Our customer from London came to us looking for a large dining surface. Natalie envisioned a robust, 10-seater oak table that is both stunning and future-proof. She envisioned a surface for years to come, something more than just a piece of furniture, a work of art. The design of the solid oak top is comprised of 3 book-matched (originating from the same tree) character planks. The planks were chosen from the vast selection at our timber yard, kiln-dried to below 10% moisture content using our on-site vacuum kiln, and treated with clear epoxy resin. The resin technique encloses earthy knots and voids in a solid, transparent layer to enhance and preserve the natural features of wood. The unique combination of epoxy and precise kiln-drying guarantees maximum durability and ceaseless stability. The table is also accompanied by a pair of elegant, 140mm x 140mm solid oak legs handcrafted specifically upon the customer’s request. The legs are sturdy and easily removable, allowing for convenient transportation and assembly. Matching with the overall theme of the top, the design of the legs beautifully complements the straight edges of the surface. full of character and beautiful knots, resin infill rustic oak worktops, bespoke worktops. Our customers from New Forest recently invited us back for lunch and were kind enough to let us snap a few photos of their kitchen featuring our full stave character worktops with resin infill. Sue and Richard contacted us looking for a complete wooden-surface solution as the final piece to their stunning house extension and we are thrilled about sharing the results with you. Sue & Richard chose to have our modern-rustic range of oak surfaces to finish their house extension in style. The project features long-stave oak tops with matching single-plank shelves, up-stands and window sills. The worktops have been cleverly reinforced with end cups of both ends for aesthetic and durability purposes (to protect the timber from the heat generated by the cooker). Sue and Richard also opted for our innovative bark preservation technique, which preserves the bark in a hard, transparent resin capsule – perfect for those who love the natural qualities of wood. We have also included resin inserts over knots and voids, covering them in a clear blanket that enhances the organic characteristics of their surface whilst making it hygienic use and resistant to wear. It’s safe to say the outcome is a truly authentic and thought-through design that beautifully accents the warm brick wall and oak floor. Sue and Richard came to us knowing exactly seeing the examples of our work on our website, it was then up to us make the concept come alive. Richard and Sue also came up with the brilliant idea to make matching cheeseboards and breadboards from sink and hob cut-outs, further contributing to harmony within the all-new addition to their home. We’ve had a great time catching up with Richard, Sue, their daughter Emma and her lovely son Alex. It’s delightful to hear that our customers are so pleased with the results. We now look forward to the future and the projects ahead, no matter how wild and abstract they may be. We love challenges… give us a try. Bespoke English walnut surfaces designed for a customer in Ifield, Sussex. This project is the result of a collaboration with a kitchen showroom, and features resin-enhanced walnut worktops, upstands and a large island as the centrepiece of a practical, modern kitchen. The service was extended to an additional utility room. The natural warmth and radiance of walnut provides an appealing contrast between the invigorating turquoise and cool grey finish of the cupboards and shelves. The worktops and island have been fitted with end-caps to ensure protection from heat generated by the cooker. This simplistic technique of surface protection also makes for an aesthetically pleasing feature that brings depth to the design. All surfaces used for this project were handcrafted at our workshop in Plumpton Green and treated with a blend of high-quality, fragrant oils. The timber was kiln-dried to below 10% moisture content using our on-site vacuum kiln. The island is 2.5m long and over 1.6m wide. The end-caps are running along the length of the island.